Revolution is a 1985 historical drama directed by Hugh Hudson, written by Robert Dillon and starring Al Pacino, Donald Sutherland and Nastassja Kinski. 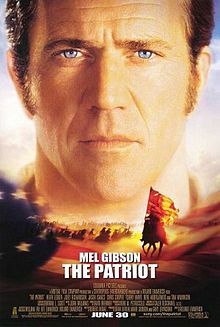 The film stars Pacino as a New York fur trapper who involuntarily gets enrolled in the Revolutionary forces during the American Revolutionary War. The film was a major commercial and critical failure upon release, leading Pacino to take a four-year hiatus from films until 1989’s Sea of Love. 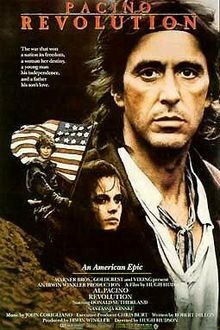 Fur trapper Tom Dobb (Pacino) unwillingly participates in the American Revolutionary War after his son Ned (Fletcher) is drafted into the Army. Later, his son is captured by the British, and taken by the strict Sergeant Major Peasy (Sutherland). Dobb attempts to find him, and along the way, becomes convinced that he must help fight for the freedom of the Colonies, alongside the disgraced & idealistic aristocrat Daisy McConnahay (Kinski). 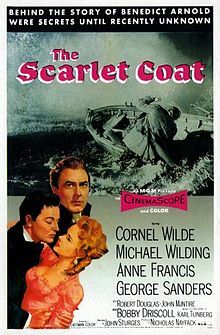 The film was produced by the British company Goldcrest, and was filmed largely in the old dock area of the English port town of King’s Lynn. The main battles scenes were filmed at Burrator Reservoir on Dartmoor in Devon and on the coastal cliff top near Challabought Bay, South Devon where a wooden fort was built. Military extras were recruited from ex-servicemen mainly from the Plymouth, South Devon, area. Revolution cost $28 million to make, and proved to be a box-office disaster, only grossing $346,761 in the United States. 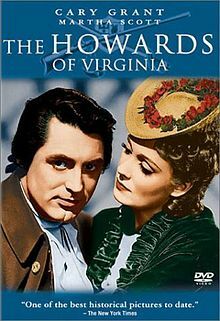 The film was also a critical letdown, with many criticizing the performances (especially the accents), writing, and choice to shoot a story of American history in England. It currently holds a critical approval rating of a mere 8% at Rotten Tomatoes. It was nominated for four Razzie Awards, including Worst Picture, Worst Director, Worst Actor and Worst Musical Score. The movie won a Stinkers Bad Movie Awards for Worst Picture. Dissatisfied, Hudson would revisit the film years later, and released a new cut on DVD; Revolution: Revisited, in 2009. This has an added narration by Al Pacino (recorded for this release, though it was meant to be in the original version), as well as ten minutes of footage being cut. Also of note is an included special feature: a conversation with Pacino and Hudson discussing the film being rushed for a Christmas release (primarily Goldcrest films), being trashed by the critics, and other issues relating to making and releasing Revolution. The film was also released in the UK in 2012 by the British Film Institute in a Blu-ray Disc/DVD combo pack. This edition came with both cuts of the film, as well as a booklet with essays written by Nick Redman, Michael Brooke and critic Philip French, who argues that the film was a victim of bad publicity and cultural misunderstandings, and regards the ‘Revisited’ cut as a ‘masterpiece’.